Like thousands of stamp enthusiasts, I love the Riley images from Hanna Stamps. This little fella is quite talented (a jack of all trades) and is the cutest moose on the planet! I hope to make more cards using my assortment of Rileys. 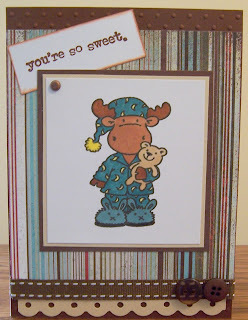 My latest creation features SleepyTime Riley, DP by Basic Grey, SU cardstock, ribbon, and buttons. I colored Riley with my Copic markers and added a little fun flock to the fur ball on his cap.